Chocolate. Enjoyed today and popular back in colonial times too. But it wasn't quite as simple as dropping in to a store and buying some candy. Some chocolate came in flat little unsweetened wafers that required grinding and crushing before they could be incorporated into a recipe. Some recipes were simple, others more complex. 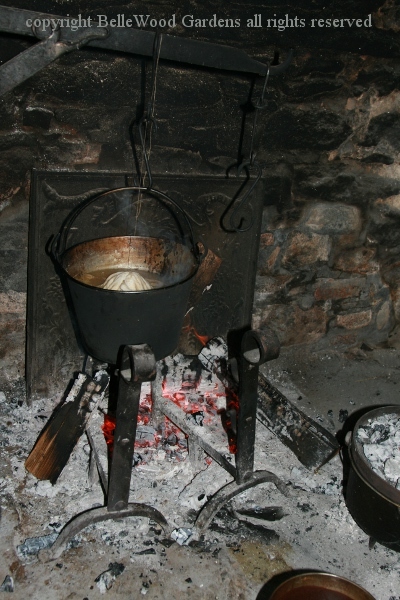 And today, Connie Unangst is demonstrating the skills and techniques that an 18th century housewife would need, using the original open hearth at the Bouman Stickney Museum. She has American Heritage Chocolate, a specialty, limited distribution product developed by the Mars Company. It contains chocolate, sugar, cocoa butter, spices such as black pepper and nutmeg, and natural flavorings. Let's begin. First make your fire, and develop a good bed of hot red coals. And without appliances, it takes muscle power to whisk the batter. 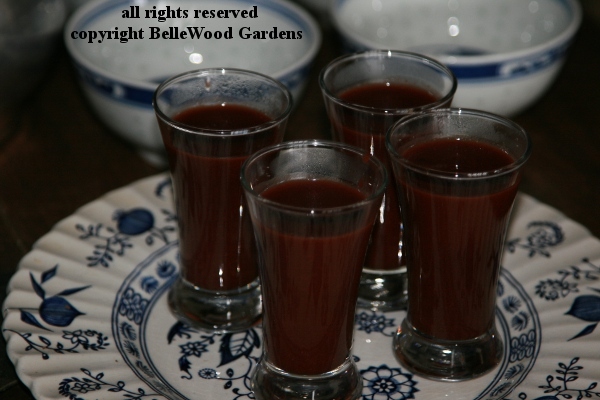 Although uses in cooking and baking began to appear in the second part of the century, in the 18th century chocolate was enjoyed as a beverage, Here, Connie has prepared John Nott's wine chocolate, created in 1726. To wit: In a heavy saucepan combine 12 ounces of port wine and 2 ounces of bittersweet chocolate, grated. Add 1/3 cup sugar (or to taste) and 1 teaspoon cornstarch. Bring to a boil, beating constantly. Then serve in 4 glasses. Today, there were chocolate puffs to accompany the wine chocolate. 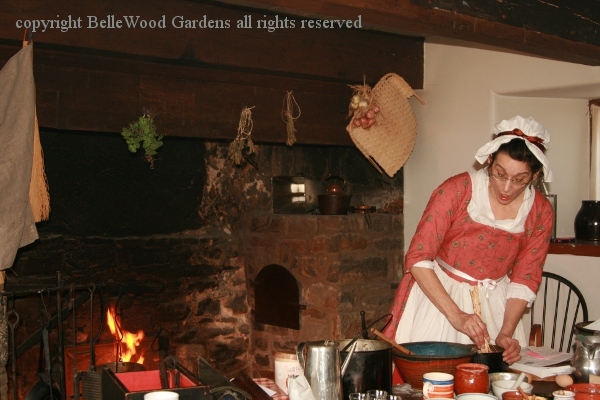 The original recipe from "The Experienced English House-Keeper" (first published in 1769) goes like this: Beat and sift half a Pound of double refined Sugar, scrape into it one Ounce of Chocolate very fine, mix them together. Beat the White of an Egg to a very high Froth, then threw in your Sugar and Chocolate. Keep beating it 'till it is as stiff as a Paste. Sugar your Papers, and drop them on about the Size of a Six-pence, and bake them in a very slow Oven. 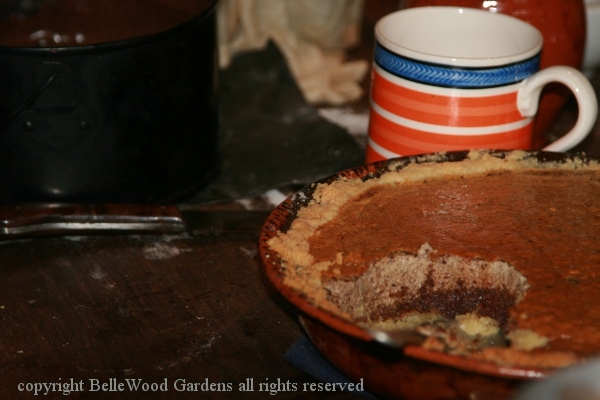 More complex is John Nott's recipe for a chocolate tart. Now, the wine chocolate was rather basic. His cookbook, "The Cooks and Confectioners Dictionary, Or, The Accomplish'd Housewifes Companion" published in 1723 was clearly intended for those of some means, as evidenced by extravagant use of sugar in recipes. Sugar remained a luxury item for most people until well into the 19th century. 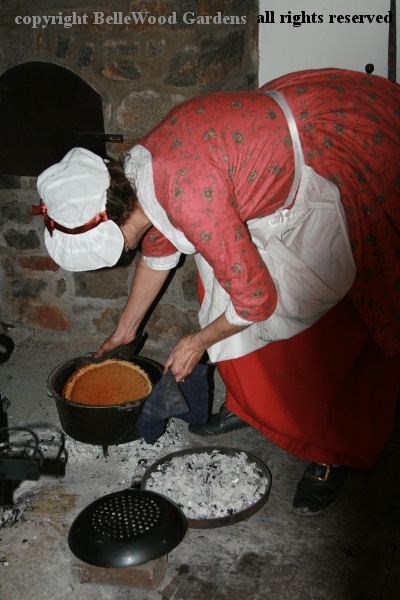 Having baked her chocolate tart in a Dutch oven (that's the coal and ash covered lid by her foot), Connie uses pieces of leather to protect her hands as she removes it from the hot pot. Mix a little Milk, the Yolks of ten Eggs, with two Spoonfuls of Rice-flour, and little Salt. Then add a Quart of Cream, and Sugar to your Palate. Make it boil, but take care it do not curdle. Then grate Chocolate into a Plate, dry it at the Fire, and having taken off your Cream, mix you Chocolate with it, stirring it well in, and set it by to cool. Then sheet a Tart=pan, put in your Mixture, bake it. Seems to have separated in the baking process, with a chocolate layer at the bottom. 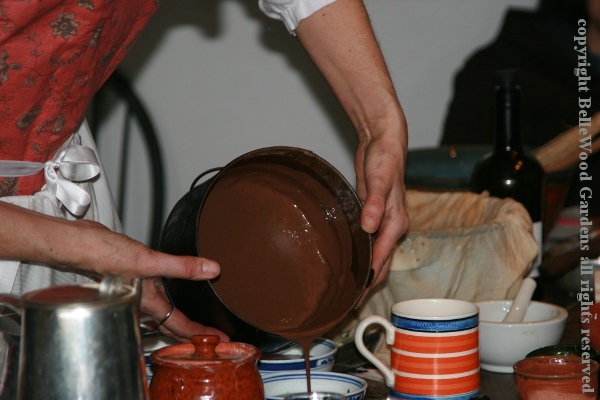 Pouring a chocolate pudding into bowls. 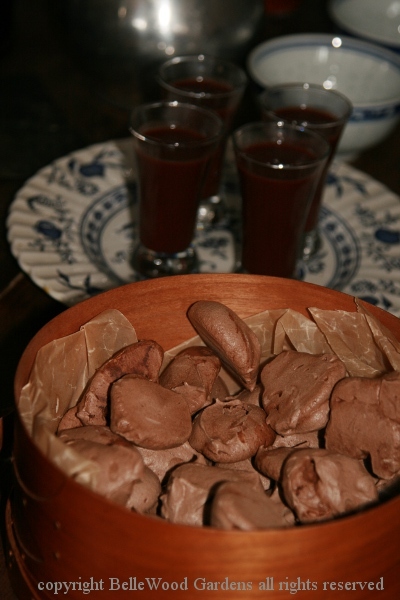 As well as the various chocolate recipes, Connie also made frumenty, boiled in a pudding cloth. It was elaborated with currants, sugar, saffron, orange flower water, and brandy. Ladylike, and an accomplished, experienced housekeeper. As well, an entertaining, informative presenter. 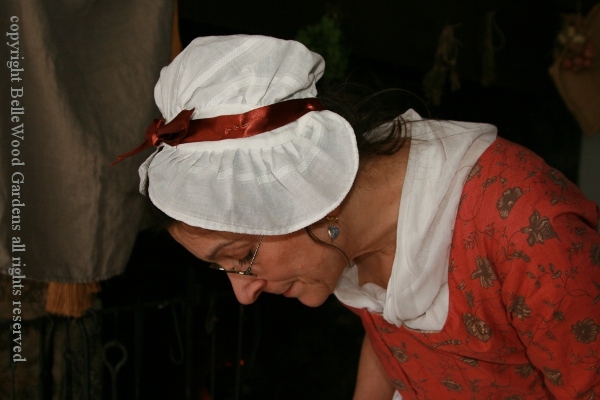 Connie will be back at Bouman Stickney Museum on Sunday, 6 March 2016 from 1:00 to 4:00 p.m., to demonstrate butter churning, explain about curds and whey, and perhaps also clotted cream.